90th Birthday Blessings to Aunty Lois! Fr. Nahoa giving our own Lois Murphy a special birthday blessing. Lois is a lifelong, stalwart member of St. John's and a blessing to all of us! Mahalo to Ruth Shiroma Foster for this photo. 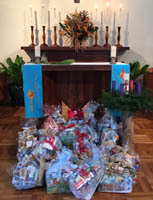 Warm thanks to Louise Aloy and the other Episcopal Church Women (ECW) who assembled holiday gift baskets for congregations such as St. John's by-the-Sea to share with those who'd enjoy them! With the support of several churches throughout the diocese, ECW members collected toiletries and nonperishable foods over the past 9 months to create the baskets. Thanks to Vicki Fay for this photo of some of the baskets at St. John's For more information about the ECW and their project, see the December 2016 issue of the Hawaiian Church Chronicle. On Saturday, August 27, 2016, at St. John's by-the-Sea, Paul Nahoa Lucas was ordained to the priesthood by the Right Rev. Robert Fitzpatrick. The sermon was given by Canada's National Indigenous Anglican Bishop, the Right Rev. Mark MacDonald. The out of town guests include the Rev. Canon Debbie Royals, Director of the Native American Ministries in the Diocese of Arizona, and Rev. Rose Mary Joe-Kinale, Paiute-Shoshone Priest from the Diocese of Nevada, who presented Rev. Nahoa with a Golden Eagle feather from her Tribe as a symbol of worship from her tribe. 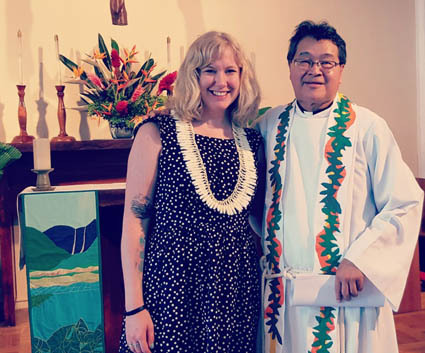 More than 170 people attended the ceremony, which was followed by a lu‘au in Ho‘okano Hall. Music was provided by Smooth Remedy, consisting of members Aaron Domingo, Kamaehu Naipo, and Shane Tsukiyama. See more photos, courtesy of Vicki Fay. 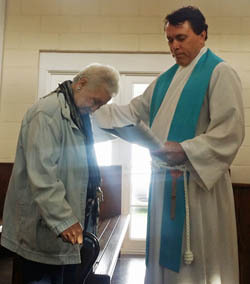 As a special gift from St. John's, members of the congregation designed and embroidered a special priestly stole for Fr. 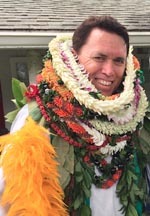 Nahoa, with images including ulu (breadfruit), ki (ti leaf), kalo (taro), hala (pandanus), kukui (candlenut) and 'ohia lehua. Pictured below with Fr. 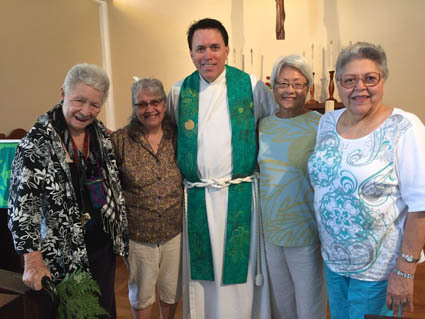 Nahoa are those who made the stole: Lois Murphy, Celia Fraser, Leone Leong, and Tensie Lee. Los Angeles Choir Meets New Caledonians at St. John's! A serendipitous cultural exchange emerged when the La Cañada High School Chamber Singers (from Los Angeles, CA) came to St. John's on February 13 to give free concert and our visitors from New Caledonia (staying at Ho'okano Hall) were here to hear them and offered to perform for them afterwards. 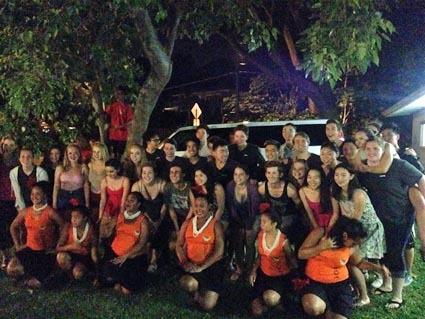 Some of the LA students were studying French, but music was the primary common language as the groups took to each other and ended up dancing together under the kukui tree! 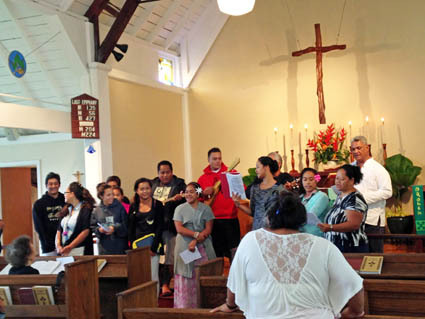 In the Sunday service on February 6, we welcomed the participation of a visiting group from New Caledonia who are our guests in Ho'okano Hall. 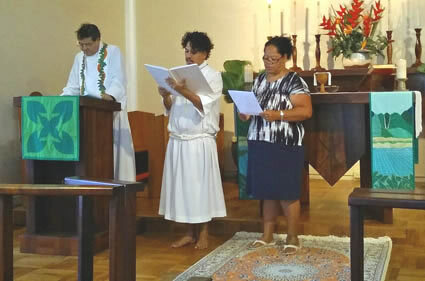 The Gospel was read as usual in Hawaiian and English, but this time also in French, by one of our visitors. 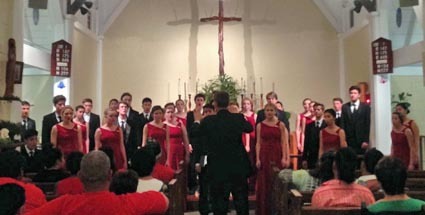 The group also performed two hymns for the congregation. Melanie Delva is archivist for the Diocese of New Westminster and for the Ecclesiastical Province of British Columbia and the Yukon. On Sunday, January 31, 2016, she shared with St. John's how her views on Indigenous people changed while she was collecting records for Canada's Truth and Reconciliation Commission. Here is a link to a similar talk she recently gave to the Anglican Church of Canada.